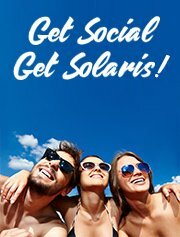 Everything is already set up for you at Royal Solaris Restaurants, that includes all your meals and drinks, all you can have until you are satisfied. The Bars and Restaurants at Royal Solaris have it all. Mussels Coquille? Asparagus soup? Seafood tacos? A slice of pizza? Come and delight yourself! Our restaurant offers International specilties a gourmet menu with VIP service and a romantic setting, perfect for that special dinner with your couple. Our special place in this cabo all inclusive resort to present you the flavors of Mexico. Try traditional dishes such as Cochinita Pibil, Tampiqueña meat and other dishes that combine authentic recipes and ingredients of the Mexican cuisine. Remember to ask for the menu of members which contains different meals and options for vegetarians. Start your day with a delicious breakfast: enjoy your favorite juice, coffee or hot chocolate and taste the different options we have for you: Omelettes made at the moment by the always smiley Chef Lucy, hot cakes, cereal, yogurt and more! Delight yourself with a fine selection of Mediterranean food and other specialties Rosmarinus has prepared for you. 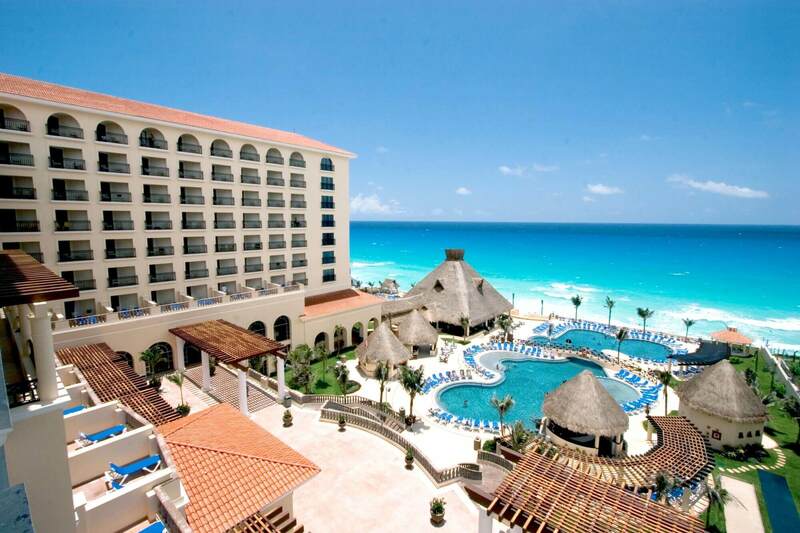 Located in our beautiful Palapa. 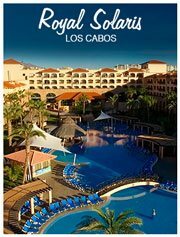 It's a perfect choice to have beautiful family moments in this hotel in Cabo. Enjoy once a week a Brazilian atmosphere at Rosmarinus with a Rodizio dinner offering a variety of rotisserie grilled meats, a gourmet salad bar and a variety of sides. 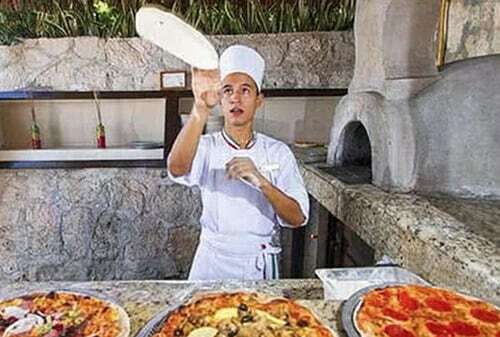 It's time to eat pizzas at Royal Solaris Solaris Cabos! Pizzallisima is the place where you can enjoy pizzas fresh from the oven, offering 7 varieties of pizza on the menu, or if you prefer you can also create your pizza with any of our fresh ingredients. Close to the Snack bar, Next to the main pool you will find The Sushi Bar, where you can select from a variety of rolls created by our chef. 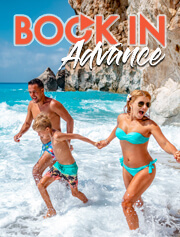 The Snack Bar is the place to calm your cravings while you get the perfect tan in this beautiful hotel in cabo, just walk some steps from the pool and get delighted with hamburgers, french fries freshly made or hot dogs. 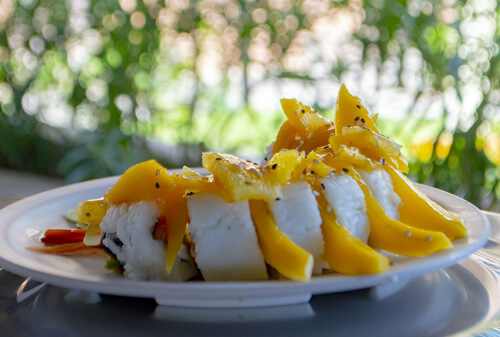 Is not what you are looking for?, ask the Chef for your favorite sushi roll from our menu, or create your own with by selecting the ingredients from the list. 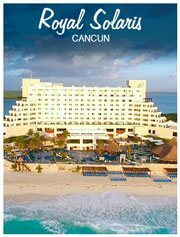 Dining at Marco Polo in our cancun all inclusive resort, will delight your palate with international specialities. The author's gourmet menu created only for Members, along with the elegant setting and a spectacular view the Caribbean Sea, create the ideal opportunity for a spontaneous romantic dinner with your loved one. On Rosmarinus palapa, you will enjoy a diverse international buffet, where you can find fresh vegetables to create your salad, different preparations of meat, Mexican food and of course sweet desserts for you to enjoy the panoramic view of the Caribean Sea. Do not feel in the mood for sushi? 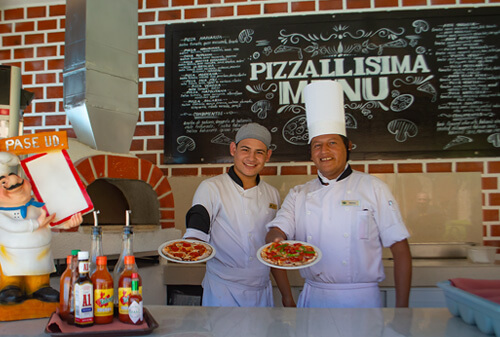 Walk some footsteps further to Pizzallizima, a small restaurant palapa with a stone oven and a delightful variety of pizzas, including a daily specialty. Feel free to create your own pizza with our daily fresh ingredients. 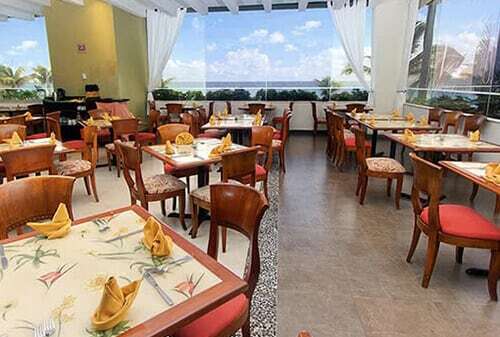 Beautiful and conveniently located buffet restaurant near the lobby of Royal Solaris Cancun. By morning, you can have a wide variety of fresh fruit, juices, and the classics for brunch. By night, Las Fuentes restaurant offers you for dinner, a delicious buffet with a delicious daily theme night. 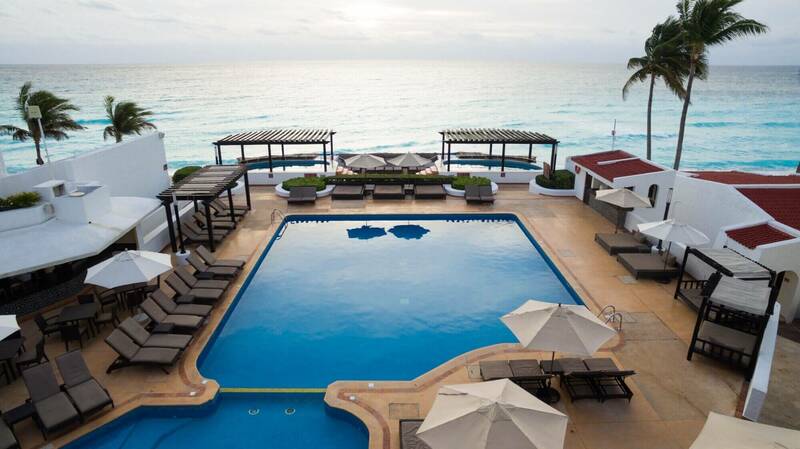 Strategically located close to the swim-up bar of this beautiful Cancun Resort, are the palapas belonging to the Snack Bar, where you can relax and satisfy your mid-day carvings with our tasty fast food buffet cooked at the moment by the Chef. Choose seven different types of cuisine during the week and enjoy unique experiences at your dinner. Our specialty restaurant offers a gourmet menu with VIP service and a romantic atmosphere, perfect for that special dinner with your partner. Enjoy your favorite juice from the juice bar made with the traditional fruits and mexican dishes from the buffet. 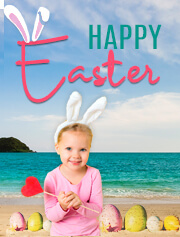 Ask our chef for your choice of eggs made at the moment. 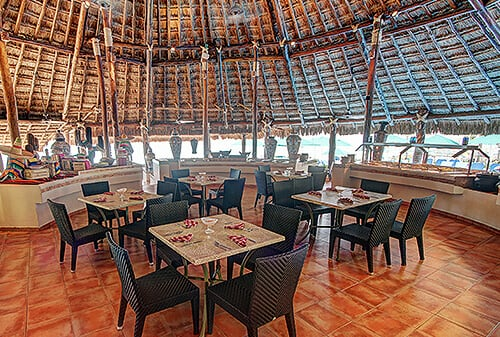 Our casual restaurant with a beautiful view of the Caribbean beach. Choose between cold or hot dishes, juicy steaks, fresh salads, tasty Mexican dishes, and desserts. 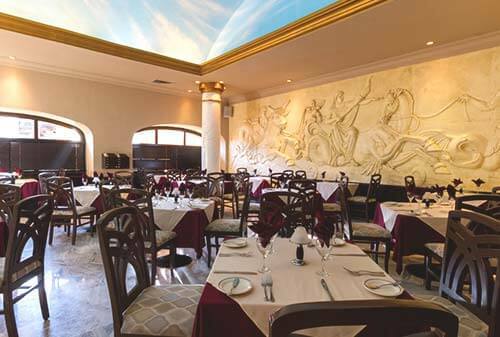 Enjoy once a week a Brazilian atmosphere at this cancun resort with a Rodizio dinner, that offers a variety of grilled meats, a gourmet salad bar and a variety of sides.We have a variety of menus so you can enjoy different types of cuisine. Come to Le Cinque Terre where we have six different pizza varieties just out of the oven as Hawaiian pizza, Greek pizza, etc., or if you prefer you can also create your pizza with any of our fresh ingredients. 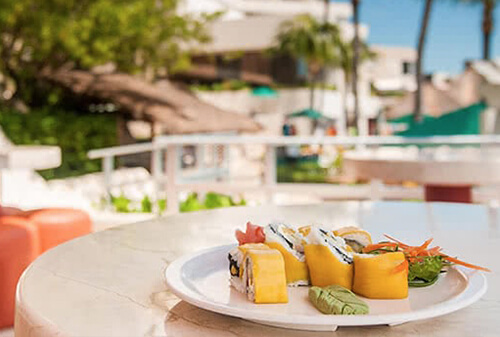 Enjoy the delicious unmatched taste of the oriental cuisine at GR Solaris Cancun: Chinese, Thai, Vietnamese, and Japanese, in a casual atmosphere and beautiful views of the garden and pool areas. Deli is the informal place that is next to the Club GR Solaris pool that offers delicious snacks and desserts. From baguettes made at the moment to delicious brownies fresh out of the oven. Deli is the corner where you can relax. 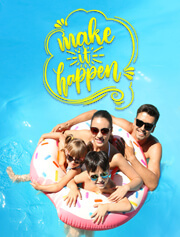 Visit the snack bar near the pool and satisfy your appetite of hamburgers, hot dogs, daily specials and refreshing drinks. 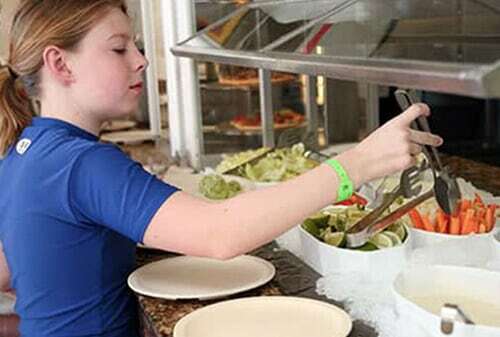 Start your day at your cancun all inclusive resort Enjoying a delicious breakfast, where you can choose from refreshing natural fruit juices, fresh coffee, Danish bread, and various delicacies from Mexican cuisine. During the evenings, you can choose between the specialty menu or the international buffet. Conveniently located in the pool area, the Deli Snack Bar at GR Caribe Cancun resort has the perfect selection of snacks (also vegetarian) and beverages. It is not necessary to walk there to take your snack. Just raise your arm and one of our waiters will be happy to serve you in your lounge Chair. Enjoy the day or night, the incredible Bogavante terrace with its unique view of the Caribbean Sea, and a wide selection of seafood specialties and international meats, Asian cuisine meals are also offered for dinner. Veneto awaits you with a lovely sunset over the nichupté lagoon, try the delicious International meals from our menu or the innovative and creative author's cuisine menu.